The quest to find the perfect cupcake in North Palm Beach and beyond. Send your nominations to northpalmlife@gmail.com, and check back for new entries as the search goes on! LADY BUG CAKE CREATIONS. Imagine my delight when I spied a Groupon for a place in the Palm Beaches featuring a deal on cupcakes. The photo on the Groupon touting Ladybug Cake Creations caught my eye. Yes, it was of cupcakes. 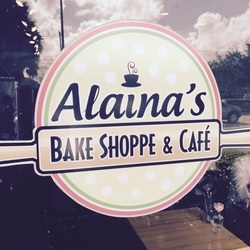 ALAINA'S. Located in Palm Beach Gardens at 4377 Northlake Blvd., they describe themselves as "a cozy neighborhood café where you can stop in and indulge your sweet tooth with one of our delicious treats, or to satisfy your savory side with any of our tasty lunch selections." 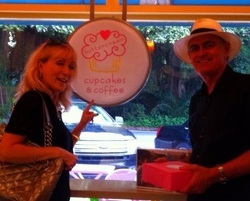 Of course, one of their most popular treats are their cupcakes. You can buy them full-size or mini, in an assortment of flavors. We tried vanilla, red velvet and wedding cake. They recommend serving them at room temperature for optimum flavor. The frosting is creamy and dreamy, and the cake moist and rich. Get there early before they're all gone. BUTTERCREAM CUPCAKES AND COFFEE. Yes, you have to drive all the way to Coral Gables if you want to try a cupcake from Buttercream. But oh, is it worth the drive! The shop is at 1411 Sunset Dr. in the University of Miami area. Their website features a handy chart for what flavors are available on what days. One of our favorites are the orange-flavored, which can only be bought on Sundays. But you can't go wrong with any selection here. Luscious, and moist, and oh-so-good. By the way, that's us on the left, doing our due diligence, quality control. Someone has to do it! DD's CUPCAKE SHOPPE. People looking for a "cupcake fix" in the Jupiter area know where to go: DD's, at 121 Center St. in Jupiter. They truly have something for every size and taste, from mini- and regular-size cupcakes to cupcake "cakes" that can serve one or more than 15. And so many flavors -- who could decide? For example: There's "The Hummingbird" (fresh banana, pineapple, pecan cake with cinnamon cream cheese frosting topped with pecan and banana runt) and one they call "Kiss Me I’m Dreaming (white cake with vanilla buttercream frosting and a hershey kiss on top). Pinch us. We're in Heaven. MARRIOTT SINGER ISLAND. Executive pastry chef Brittani Szczecina is in charge of all things sweet, including the yummy cupcakes they sell in the lobby shop of the Marriott Singer Island Resort and Spa. We sampled the "Sundae Cupcakes" and loved the creamy frosting with the confetti sprinkles. It will make you want to sample more of Brittani's confectionary handiwork.